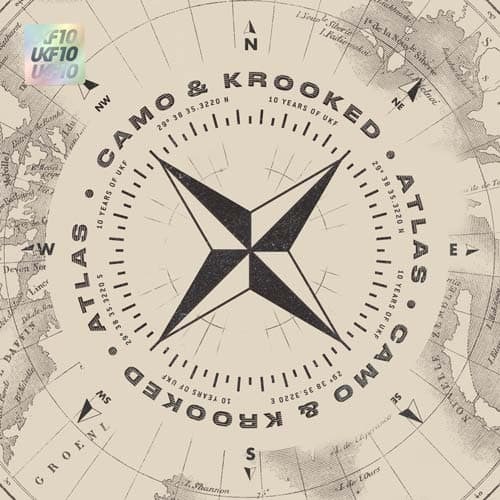 We kicked off UKF10 with Camo & Krooked’s Atlas – a concentrated shot of cinematic, euphoric drum & bass, carved and sculpted in the duo’s singular and instantly recognisable cosmic signature, a moment where two of the most prominent contemporary D&B stars align. The Austrian duo’s first new material since their multiple award-winning 2017 album Mosaik not only marks a new chapter for perennially level raisers Camo & Krooked, hinting at new slew of emotive designs they’ve been working on for the last two years, but it also marks the start of our celebrations for 10 years of UKF. Emerging around the same time and developing in global and scene stature and influence, Camo & Krooked and UKF have grown together and collaborated with game changing track premiers and headline bookings at UKF’s international events. ‘Atlas’ galvanises this collaborative spirit in the best possible way in both its timely arrival and how it sounds sonically: triumphant, positive and unifying. The sounds and spirit that have inspired both Camo & Krooked and UKF since they both emerged a decade ago.